Get your home holiday-ready with the best pricing of the year on paint from Sherwin Williams. 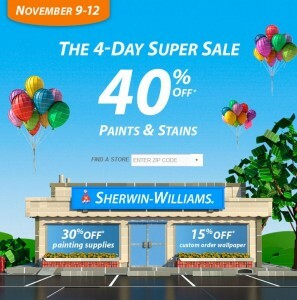 From November 9-12, 2012, save 40% on paints and stains from Sherwin Williams. This is the best sale price they offer, so be sure to take advantage if you have a home improvement project coming up! You can also save 30% on painting supplies and 15% on custom order wallpaper. No coupon necessary. Click the photo or link above to visit the Sherwin Williams website to find a store near you. What are you planning to paint? And, more importantly, what color will you use?